Poor, poor Placebo. They can barely fill mid-sized halls here in the US, but over in Europe, as this live concert DVD attests, they are big, big stars. I mean huge. The type of band whose concerts can pack in more French fans than a soccer championship. And the events are a whole lot sexier, too. Plugging at it for ten years and over the course of four albums, Placebo has refined its trademark mix of glam, frantic pop and throbbing rock. Frontman Brian Molko is a diminutive, androgynous English lad and every bit the rock star. Guitarist Stefan Olsdal is bone-thin and lanky, towering above Molko as he whips out fiery guitar licks and schlocky dance-swaying, while drummer Steve Hewitt appears perpetually sweaty and allergic to shirts. This eye-popping DVD captures the tempting trio, bolstered by an added keyboardist, at their absolute finest. The 21 songs, culled primarily from Sleeping with Ghosts, and almost wholly ignoring the band's debut, sound great and the epileptic lights, tricky special effects and whiplash camera angles bring a real sense of immediacy and liveliness to this stunning concert film. The rapid montage of shots takes the viewer from within kissing distance of Molko to the far end of the stadium and then looking over Hewitt's soaked shoulder in under ten seconds. While those with long attention spans may long for more static shots, the furious pace is in line with Placebo's sound and aesthetic. Treats come in the form of Molko doling out a French-language version of "Protect Me From What I Want" and the appearance of Frank Black who helps out the boys with their spot-on cover of the Pixies' "Where is My Mind?" 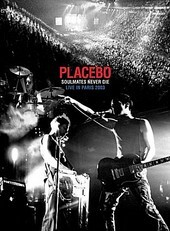 While none of Placebo's arresting videos are included on this must-have DVD, there is an entertaining 25-minute documentary that gives the viewer a look into Placebo's loving off-stage banter and camaraderie as they tour the world. And for some, the fact that Molko flashes his bare bottom will be enough to seal the sale.